There’s no doubting Colin Tate’s love and passion for all things trucking. Ahead of the 2016 Full of the Pipe Truck Show Ireland, we caught up with the County Monaghan man at his Clontibret base to discuss the imminent trucking extravaganza and his own eye-catching fleet. 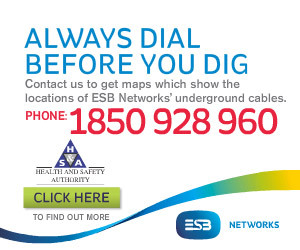 Full of the Pipe Truck Show Ireland is a nice breather for the hardworking truckers of Ireland and beyond. They bring their trucks and put them on display so that others can get an idea of the huge levels of devotion that go into keeping these vehicles in tip-top condition. 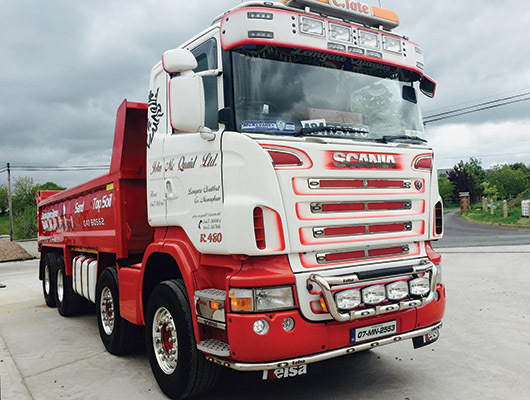 As the eponymous individual behind Colin Tate Ltd. and Colin Tate Sand and Decorative Stone, Monaghan man Colin Tate oversees a fantastic fleet of four trucks from his Clontibret base on the outskirts of Monaghan town. He’ll be bringing a couple of beauties to Cavan Equestrian Centre the weekend of June 11th/12th, 2016! The 2007-reg eight-wheel tipper is a veteran of many’s the show (“I bring it to a right few and also to a lot of charity runs”), while, in stark contrast. the spectacular 161 unit is very much the new kid on the block. The stunning white and red beast – replete with eye-catching company livery – was purchased from McElvaney Motors in January and hasn’t aged a second since! While it’s all about taking part to an extent, Colin feels that the prizes are important and admits he’d definitely rather go home with something in the cab beside him rather than nothing… “If you put in 100% and have the truck looking good and come home with a trophy, that’s a nice feeling. It reflects the pride you have in your vehicle and the work you put in. It might be only a small reward but they are important and I certainly like to pick them up. And then there’s the fun side of the weekend, the social element, where likeminded people come together to renew acquaintances and shoot the breeze. “It’s a good weekend’s craic and it’s nice to meet people again from the circuit and also to meet some new faces. The people there all have a lot in common and the atmosphere is always good. “It’s a good window to show off your truck and to demonstrate to people the pride you take in it and to let them see the condition it’s in. It’s nice to have that opportunity to show them off. Colin Tate Sand and Decorative Stone is one of the North East’s leading suppliers of decorative stone, grave stones, bark mulch, sand and top soil, while parent company Colin Tate Ltd. is a general haulage company that specialises in and delivers driveway stones, grave stones and flowerbed finishes. Colin Tate delivers decorative stone within the following areas: Monaghan, Tyrone, Cavan, Armagh, Fermanagh, Clontibret, Ballybay, Clones, Carrickmacross, Castleblayney, Keady, Derrynoose, Crossmaglen, Newry, Cullyhanna, Dundalk etc. They also provide a service of preparing the driveway and the laying of driveway stones, while a wide range of building materials is available for building and plastering, including sand, cement and concrete mix.